Our November issue of Intercom is out now! On our cover this month we feature Dom Michael Ryan, Abbot of Bolton Abbey, where the Cistercian lifestyle fosters an atmosphere of stillness and quiet. Inside the new issue we feature a photo-article on life in Bolton Abbey. 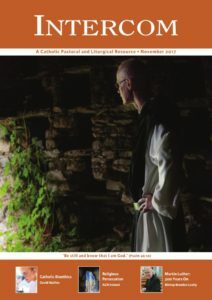 Also in our new issue, Bishop Brendan Leahy, Bishop of Limerick, writes on Church Renewal as we mark the 500th anniversary of the Reformation; Salvador Ryan writes a persona reflection on Death and the Irish; and Fr Kieran J. O’Mahony OSA offers an annotated bibliography on the Gospel of Mark. As we look ahead to the WMOF 2018, Catherine Wiley, founder of the Catholic Grandparents Association, writes on the role of Grandparents in passing on the faith and Brenda Drumm introduces us to The Humans of World Meeting of Families 2018. All this and more, as well as all our usual prayers, reflections and resources for the month of November. Click here to see the full contents page of our November issue. Our November resources are available here. There are two ways to subscribe to Intercom. For information on online and digital subscription click here. Alternatively, the membership secretary, Mr Ross Delmar, can be contacted at Veritas House, 7/8 Lower Abbey Street,Dublin 1, by telephone +353 (0)1 878 8177, and by email ross.delmar@veritas.ie.